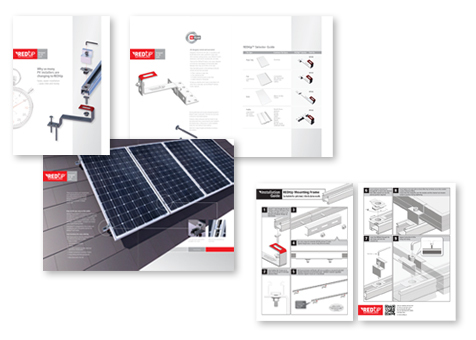 Brochures, technical manuals, website and exhibition stands were all key components of the REDtip product launch. I was commended by my client for producing high quality design work in a lightening fast time. “The last few weeks have been fast and furious – we have attempted something that would normally take six months or so to complete and we have done so in close to 6 weeks. The quality of the finished product is fantastic and definitely sets the brand up with the right visual image and is certainly a cut above the rest. When David Jackson of STF saw it for the first time he said it looked like “an Audi brochure” – I’d take that as a compliment. On behalf of everyone at Solar Seller I just wanted to thank you for your hard work and commitment to get the job done – even when at times it looked impossible. We can all be proud of the finished product. Now let’s go and sell a load of it! Brochures, technical manuals, website and exhibition stand design for the REDtip product launch.